The Czech Pirate Party has booked a significant win in local parliamentary elections. With more than ten percent of the total vote, the Pirates became the third largest party in the country, entering parliament with 22 seats. With its newly gained power, the party hopes to overhaul copyright legislation, fight corruption, and abolish Internet censorship, among other things. The political party previously took on a local anti-piracy outfit by launching their own movie download sites, making the point that linking is not a crime. In the political arena, the Czech Pirate Party booked several successes as well. In Parliamentary elections, however, the party never managed to beat the required threshold. Until this weekend. With 10.79% of the total vote, the Pirates won 22 seats in the national parliament. Not just that, they also became the third largest political party in the country, where more than 30 parties participated in the elections. The Czech Republic becomes the fourth country where a Pirate Party is represented in the national parliament, following Sweden, Germany, and Iceland, which is quite an achievement. “It is the best result of any Pirate Party in history and gives us a great mandate to transform the dynamics of Czech politics. 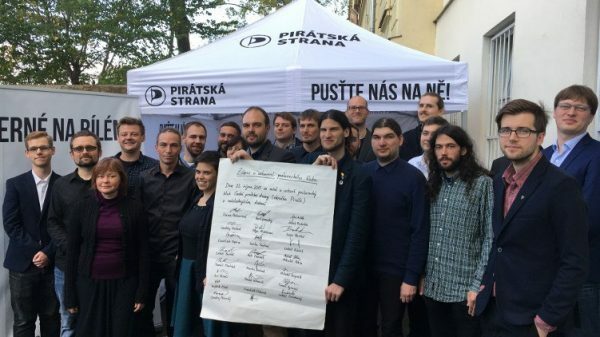 At the same time, we understand this as a huge responsibility towards the voters and the Pirate movement as a whole,” Tomáš Vymazal, one of the new Members of Parliament, tells TorrentFreak. While there were some celebrations after the election result came in, the Czech Pirate Party is moving full steam ahead. The twenty-two newly elected members have already held their first meeting, discussing how to get the most out of their negotiations with other parties. “The negotiation team has been established and the club’s chairman was elected. We’ll now need to set up our offices, hire assistants and distribute specific responsibilities among the club,” Vymazal says. The bill in question makes sure that every contract the state or a state-owned business enters into is put on the record. However, the previous parliament introduced several exceptions and as a result, many of the money flows remain hidden from the public. Like other Pirate parties, the Czech branch is by no means a single issue outfit. The party has a broad vision which it distilled to a twenty point program. In addition to fighting corruption, this includes tax reform and increasing teachers’ salaries, for example. More classical pirate themes are also on the agenda of course. The Pirate Party wants to overhaul the country’s copyright legislation, stop internet censorship, and put an end to cell phone tracking. In addition, the growing of marijuana for personal use should be allowed. With the backing of hundreds of thousands of Czechs, these and other issues will certainly be on the political agenda during the years to come. It’s now up to the Pirates to make them a reality. “We must do a very good job to successfully establish the Pirate Party in Czech politics and deliver on the promises we made to the voters,” Vymazal says.